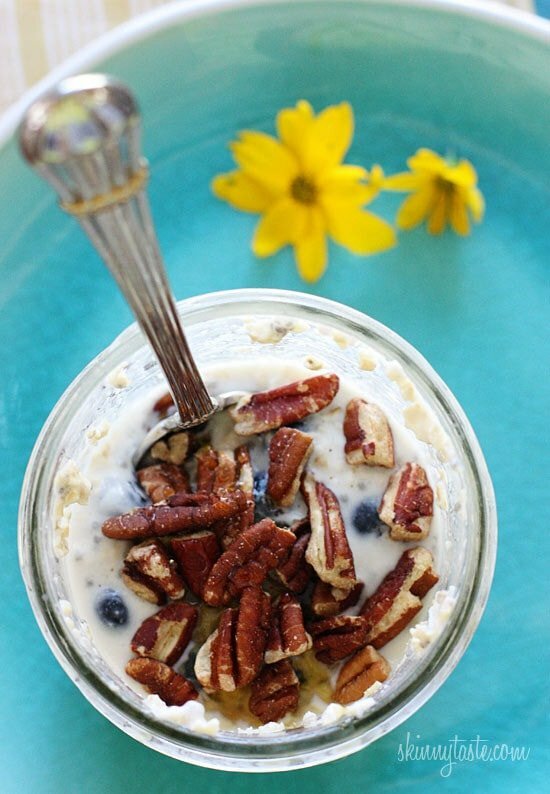 Do the 5 Smart Points include the topping (1 tbsp of pecans)? Yes! The only accurate way to determine any recipe’s SmartPoints® value is to plug the ingredients into the recipe builder on the Weight Watchers website (Click on “My Foods,” select “Recipe,” and click “Create a recipe.”) which does not count fruits and vegetables in recipes in the calculations as they are now 0 points. No one seems to want to answer the question about warming it up! It’s been asked and ignored several times and I don’t think it’s a stupid question, I’d like to know also. ????? How about you just try it and let everyone here know the outcome? Will steel cut oats work ? ???? 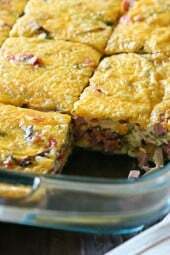 Love this quick and easy breakfast recipe. I just joined WW last week and stumbled upon some of your recipes. So happy I found you! Can i make a couple days worth like 4 or 5? i found that strawberries start to taste mushy on day 3. blueberries and bananas are ok. i make it 2-3 days worth at a time and put strawberries in the first batch. I just put the nutrition info in my WW calculator and it says 8sp???? Hi Gina- I absolutely love this recipe but I do not think 5 SP is correct. WW’s calculator comes out to 8 SP as well as the recipe builder. Is it possible the 5 SP is wrong? Thank you! Love your site! How big of a jar do I need to fit all the ingredients? what size jars are these/ do you recommend? I love this recipe so much and actually crave it. I do have one problem. Recipe states that it is 5 smart points. However when I put it in WW recipe builder, it says 4 smart points. When I put calories, fat, etc. into the WW calculator it says 8 smart points. What am I doing wrong or is thus calculated a different way. Please help, I really don’t want to give this up. The WW calculator does not work correctly since fruits and veggies have calories, it will always give you a higher point. Always use your recipe builder, if it says 4 then go with 4. Brands vary in points so perhaps it is off 1 point based on one of the ingredients you are using. Thank you for clearing that up for me. 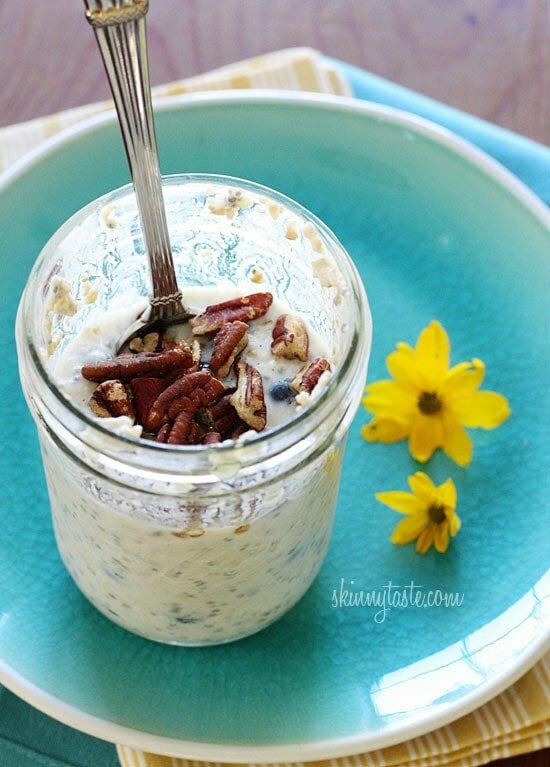 I am addicted to my Overnight Oats and was afraid I was going to have to give them up. Can you use old fashioned oats instead of quick oats? 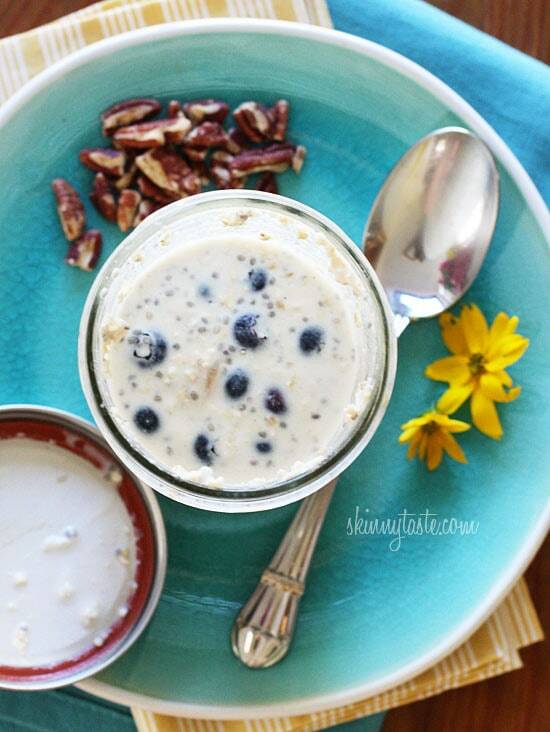 Do I have to grind the flax seeds before I put them in overnight oats? I don’t. I put a spoonful of whole seeds in every jar I make. It really helps my eczema and I like the little crunch they give. My son is allergic to cow’s milk so we ALWAYS have either coconut or almond milk. I made this with sweetened coconut milk instead of almond. Delicious!!!! I will definitely add this into my breakfast rotation!!!!! What is the recommended size of the jar?? The regular 16oz.?? P.S. I also appreciate that this recipe is completely non-dairy and also doesn’t use non-dairy yogurts, which I have never liked. Just tried this recipe for the first time, and really liked it. I had everything on hand except for a banana, so I cut up a couple of strawberries instead. Also had rolled oats, not quick oats. The rolled oats were fine, and I prefer them over quick oats anyway. Thanks for the new healthy breakfast option! How long will it last in the fridge? Can I make 5 jars for the week? I have a recipe thats similar. I make 3 pint size mason jars by cutting it in half and alternate oat days (carbs) with omlette days ( protein). Has anyone tried this with old fashioned oats instead of quick cooking? Does anyone know by chance how many smart points this is? I love making this for breakfast! 5 Smart Points, it's listed with the nutritional information. Are old fashioned oats ok for this recipe? Could this be warmed up ? 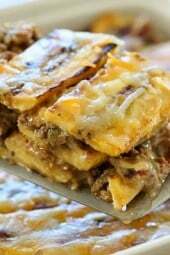 This was excellent as most of your recipes are! I have been meaning to try this for a while. I wish I didn't wait so long. I was excited to make this bought oats yesterday from Trader Joe's then realized it said quick cook steal oats. Would that work for this recipe? If not then what kind is best to use? What would the SmartPoints be for this recipe. Is there any saturated fat? I love this recipe. But I changed it slightly to make it a quick make in the morning. Put 1/3 cup oats in a bowl with some water (about same ratio for cooking rice). Microwave for 2 minutes (water should be fully absorbed) add frozen fruit (I love blueberries and mangos or blueberries and fresh cut apples), any combination of fresh and frozen fruit will do. Add 1 container of Danon light and fit greek yogurt. MIx. The frozen fruit will quickly thaw and cool down the oats. Let sit for about 1-2 minutes, then eat. YUM!!! Ready in 3-5 minutes. Slightly more calories than Gina's recipe, but hey it's the most important meal of the day, right!!! About 350 calories. PS: I also used rolled gluten free oats – worked great! I'm quite sure chia seeds are overall much better than flax seeds. However, you will have to see which suits you better in terms of the nutrition they have. If you are more for the texture, you will not be able to feel the (grounded)flax seed because of the liquid, i have not heard about the none grounded version and am not too sure about that(whether you can even buy it), chia seeds will expand thus being kinda like tapioca pearls but are harder on the inside but softer on the outside. Chia seeds are pretty small so most people usually swallow them. Hi Gina! Have you ever tried warming this up in the morning or have you always eaten it cold? I love this and just wanted to mention that it works just as well with grits! I am allergic to oats- anyone else with an oat allergy, try grits! this was really amazing! I'm so glad I finally tried it. so easy and filling! didnt have a banana but it was great anyway. thanks for all of the recipes! This was excellent. The peanut butter didn't distribute as well as anticipated but it was fun to have differing spoonfuls – PB surprise in some, others not. Also a geat way to incorporate chia instead of just mixing with yogurt. Gina I cannot tell you enough how much I love your site. It has grown so much since you first started, and I know that you get hundreds of comments per post, but I appreciate what you do. I am a believer in the "old points" system, so I am so glad that you continue to calculate the old points too. I know that there is more people out there that appreciate that too, so please keep doing it! Your site is amazing! Congrats to you on its growth and keep up the great work! Bless you and happy new year! I just tried this today and it was WONDERFUL! I didn't add any Chia because I am not a fan, I increased the banana to 1/2 and added just a small amount of honey, and left of any topping. I then put it into two smaller jars and had one for breakfast and saved one for desert! It was DELICIOUS! Does the topping count in the points value? Hi Gina! What size jars do you use for this? I'm trying to buy online and think the 16 oz jars? I made this last night and just finished eating it…OMG, I want some more!! I added a little more than a dash of cinnamon and used splenda to sweeten it. I also used unsweetened vanilla almond milk. So so yummy!! Thanks Gina!! Do you think this would be too heavy for a pre-workout breakfast? My class is more mid morning than early so I sometimes like to eat beforehand. I am on low carb diet, would also need an alternative for oats :-(! Any suggestions? Thanks in advance!!! Anyone used steel cut oats? Thank you for this recipe — it looks wonderful. What sized jar are you using? Is it 8oz or 16oz? I didn't have the chia seeds is that why is was like soup instead of oatmeal? It was tasty but like oatmeal soup. I just made "my" version of this. I used strawberries instead of blueberries and I cut my banana into quarters. I put mine in my shaker cup for protein drinks. Can't wait to dig in in the morning!!! Also…I found Chia seeds at Meijer…it was like $6 or $7…they were in the isle with rice n quinoa n barley. I made this with strawberries and blueberries. Oh my! Yummm! Do the points include the nuts on top? I made this last night and just ate it…OMG it was amazing! The only thing I changed was that I used agave syrup. So yummy, I could eat this every day! My grand daughter and I have this all summer with the fruit of the season. I use vanilla yogurt and she enjoys putting it together! Just made this and it was perfect. No stevia, so I used brown sugar. My son is not a blueberry guy, so he made his with apples and bananas instead. I'm at work and he's at home this morning, but I'm excited to find out how he liked it. He's only 5, so we are calling it "cookie soup". If this works, we may have a new healthy breakfast on our menu. Thanks Gina! I used rolled oats, left out the bananas and sweetener and it was really tasty! It is so quick and effortless to throw together that I will be making these every night. I love that you can customize these to your liking. You should try Sweetleaf 100% Natural Stevia Sweetener from Wisdom Natural Brands, it is made from only high grade stevia leaves and cool, purified water from leaf to packet. No chemicals, no alcohols, no erythritol, no ethanol or methanol, no aspartame, no sucralose, no maltodextrin, no dextrose, no additives, period. Non-GMO, allergen free and gluten free. how many raw oats did your brother eat? I haven't used any other stevia since discovering NuNaturals. I get chia seeds from Trader Joe's but will look for them at Costco, too. I like my oatmeal warm, and I guess this would work heated, too. I also don't love bananas and will try it without. Thanks for another great recipe, Gina! Can you make this without banana? I have a histamine intolerance and bananas dont agree well with me. I loved this! I know this is an older post but I just found it. I was looking for something to use my new Qi'a cereal with (Nature's Path sells a mix of chia, hemp and buckwheat seeds called Qi'a and I found it at Costco). I was just wondering if you thought it would taste just as good if I heated it up in the morning instead of eating it cold. The weather is getting cooler now and I can't see myself eating cold cereal with the winter months coming. . . I made this last night and I this morning it tastes almost carbonated. Don't get me wrong it's great but the fruit especially almost burns my tongue. I used frozen mixed berries in place of bananas. This is absolutely delicious! It has become my go to breakfast for the past 3 days. I made it for my husband who normally doesn't like whole oats and he really liked it. I've made it with blueberries and strawberries, delicious either way. Thank you for such yummy and healthy recipes. As a long-time "standard" oatmeal lover, I have to say that I was wary of making this. But I just had it for breakfast, and it was so GOOD! I also made the chia pudding yesterday and now I want to put chia in everything! Yum, thanks for yet another great recipe. Your cooking makes it into some aspect of our day almost 7 days a week! Are the nuts included in the 245 calories? I ate this for breakfast every morning last week! I also subbed flax seeds for the chia seeds, and I changed up the fruit in each one. I also used honey to sweeten and added Greek yogurt for texture. BUT, the basic recipe was the same. It is difficult to believe that these are actually good for you because they taste so good! I made them on Sunday and had breakfast for all 5 week days! YUM! Made this for breakfast for today using a banana and some champagne mangoes. Delicious! That is delicious! It will be my new favorite breakfast. Saw this link on the MyFitnessPal website. I've tried to choke down oatmeal over the years, for some reason I've never been successful, something about the consistency, I like oats in general. Tried making this last night and just finished it. I ate the whole thing. I'll admit the consistency still got to me, but not as much as oatmeal the conventional way. I'll make this again. Thanks. If you use ground flax seeds you get a much higher nutritional benefit. I was so excited to try the NuNaturals then researched it and saw it has maltodextrin in it. Not good at all for my hubby who is pre-diabetic. I will have to find another brand a little more natural. Thanks for your amazing recipies! Get the sugar free torani coffee flavors and try this instead of the stevia it nunaturals. This should work and taste very good. THIS IS AMAZING!!! I made it last night to take to the gym with me for a quick breakfast before my workout! WOW! It might be my new favorite….. This is my regular morning breakfast, tweaked a bit for my taste. I use large flake oats because I like the chewy texture. I usually just soak the oats and chia seeds in soy milk for about an hour since I normally forget to prepare it the night before. Works fine! I love coconut greek yogurt, so I enough to make it creamy and then some sliced fresh pineapple. Pina Colada Oats…so good! ok… i almost hate to post this here, because i feel like i must be an idiot if i cant make overnight oats… but i have made this 3 times now, and i get no 'expansion' overnight?? the mixture is just as watery, and looks just the same as it did when i made it. 1st i thought i had just really old oats that were 'dead' lol… but then i bought new oats yesterday, made 2.. and same result. the only other variable i can think of is i put a lid on the container, not just a piece of saran wrap laid over… so maybe there needs to be some oxygen exchange? sounds silly, but its the only thing i can think of. all the pictures i find online, it looks like the jar went from 1/2 full to full, with the oats (and chia seeds) expanding overnight… is this the correct premise? Hello, it should be expanding. I make mine with the lid on it and have no problems. What kind of oats are you using ? This looks fab! I just whipped up my first batch and it's waiting for me in the fridge. Quick question, though: the nutritional info you posted- does that include the "optional" pecans or no? I never comment on these kinds of things but WOW. This was amazing. I added plenty of cinnamon and a little cardamom and did blueberries and slivered almonds. Amazing. So enjoyed these this morning! Another winner Gina. Could you make 5 for the week or do you think that is too long in the fridge? tried this out and it was delicious! i used frozen blueberries so it turned a light purple and looked really cute! then put a pink ribbon around it! very cute for a weekend breakfast! Heyy, i did it in a completely different way. You should try to do it this way! Does anyone have any good suggestions on how to add a little more protein into the mix? Not so much to bring up the calories, but enough to keep me full a little bit longer. I was thinking of some protein powder, but I usually have that later on in the day. Thanks for this great idea! Peanut butter!!! My husband loves it. This might be a really stupid question – but do you cook the oats first in the microwave, then mix it all together and refrigerate it? Or mix it uncooked? Yum. I made this last night and had it for breakfast. I didn't have chia seeds, and my jar must've been too small because I couldn't fit blueberries, but it was delicious with banana and cinnamon. I used agave nectar instead of stevia and fat free half-and-half because I was out of skim milk. It was SO creamy. I also used old fashioned oats. So good, thanks for the recipe! Do you know if fat free half and half changes the points? Of course it changes the points!!! Have you read the ingredients of fat-free half and half? Corn syrup and preservatives. So good! I really consider this a technique and not a recipe. I have made substitutions for what I had in the house, still following the general guidelines and they all turn out good. Sometimes I only have dried fruit, so in it goes. It plumps up overnight and it great. Sometimes I only have cow's milk instead of almond. Still good. Quick oats are cut smaller so they absorb liquid quicker. However, they are also digested quicker- better to use traditional rolled oats as it is low GI and works the same is you leave overnight. Loved this. We regularly use sweetened vanilla almond milk so I used that and was able to cut back on sweetener. I used a drop of agave but next time may even skip it. I only had frozen blueberries so my whole jar turned blue but it still tasted just as good. I'm going to try this using different fruits and jams and work this into a regular morning rotation. I found chai seeds at Trader Joes. I just tried this for breakfast this morning and it was awesome I used the plastic bell jar and it worked great used the chia seeds too and used the whole banana cause I didn't have berries. I am going to make your pumpkin butter today and see how that turns out. Your site is awesome. Hi Gina, this is brilliant ! 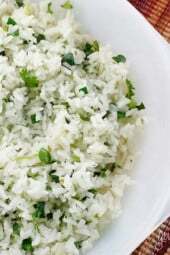 Can you use steele cut oats instead? I was thinking the same but I have serious doubts about it since they are heartier. I feel like the heat is required. Yes? I’d be happy to be wrong on this one!! I have used the quick cook steel cut oats with great success. They are cut a bit smaller than traditional steel cut and work just fine. Hi Gina, I just ran across this recipe last night. 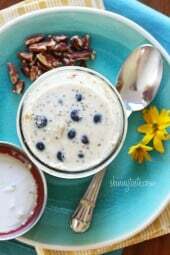 I've been eating oatmeal as my breakfast recently & was looking for new ways to prepare it. I have to admit I was skeptical at first but I ate this for breakfast this morning. MMM! mmm!, it was very tasty. It's definitely going into my list of go-to breakfast options. I already have some in the fridge for tomorrow. So do you microwave this or eat it cool or at room temp?